It has been sooooooo Hot in the Midwest. Not only hot but Humid as well. because it keeps fogging up. This is the hardest photo shoot I have done. before I lose the light from Mr. Sun again. I tried shooting photos indoors but I am just not getting the light I need. My kids love to play outdoors. after an afternoon play out in the sun. Seems like my house is the pit stop for everything at summertime. and Ice Cream Parlor for our neighborhood kids. "Mr. Greg can you please put air on my bike." "My Floating Ring does not have air, Mr. Greg, can you put air in it please." "Something broke off my scooter do you think you can fix it?" "Waaaaaaahhhhh, I just fell off my bike, I cut myself, do you have a Band-Aid?" "Do you have bug spray?" "Mom we're thirsty and huuunnngggrrry!" "Go to Aiden's house and ask them if they can help you with what ever you need." I make the kids help me make when they all raid my kitchen. Perfect for any hot summer day. Place 4-6 wafer cookies on a clean surface. Scoop 1/2 cup slightly softened ice cream of your choice on top of each butter wafer cookies or chocolate or vanilla pizzelle. Top with another wafer cookie or pizzelle. 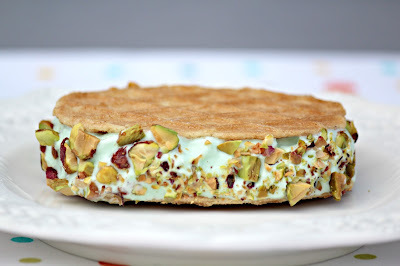 If desired, roll down ice cream sandwich in chocolate chips, sprinkles, chopped nuts or coconut flake. Pineapple Coconut Ice Cream, roll ice cream sandwich in coconut flakes. 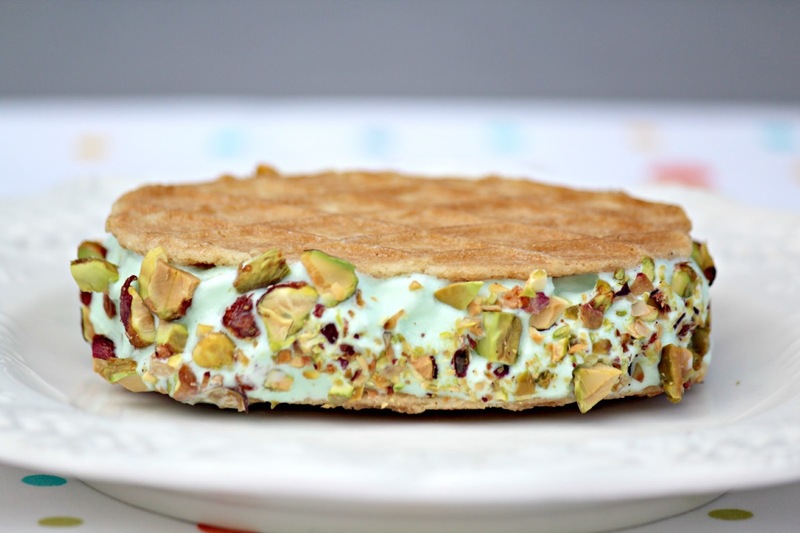 Pistachio Ice Cream, roll ice cream sandwich in chopped pistachio nuts. For the strawberry ice cream, I added more strawberry chunks. These ice cream sandwiches are a real breeze! Stay cool and eat more ice cream! Love the look of your cheerful-looking colourful ice cream sandwiches. They do look very contrasting from our sad grey-looking winter views from my window.